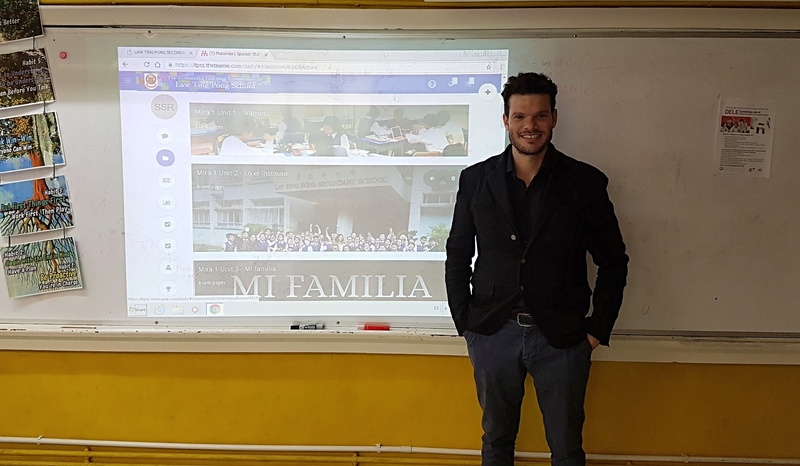 On a visit to Law Ting Pong Secondary School in Hong Kong, who have been using Teamie for two years now, I was invited to meet with Eduardo, Spanish Teacher and an avid Teamie user. Before getting into his innovative usage of the learning management system (LMS), I’ll mention the cool design of his education environment. Being a Spanish class Eduardo has arranged the tables and decor to have the look and feel of an outdoor cafe or small restaurante, sitting there you feel like a character out of a Hemingway novel, primed to start speaking Spanish or in our case talk LMS usage. 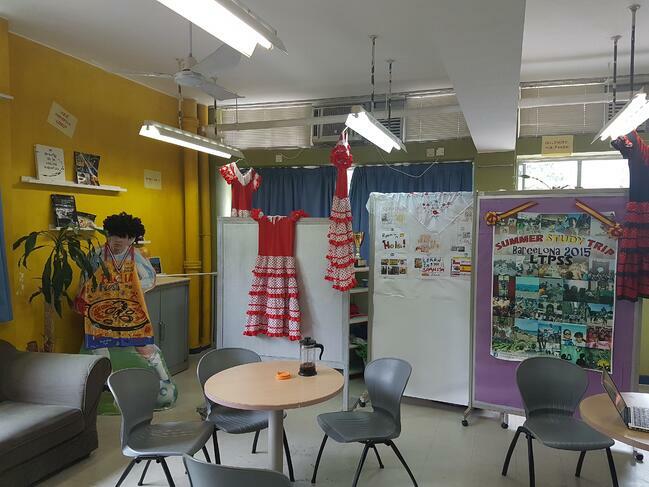 From the onset of adopting Teamie, Eduardo and his Spanish department set up a departmental workspace, (much like another school's Middle School English departmental workspace). 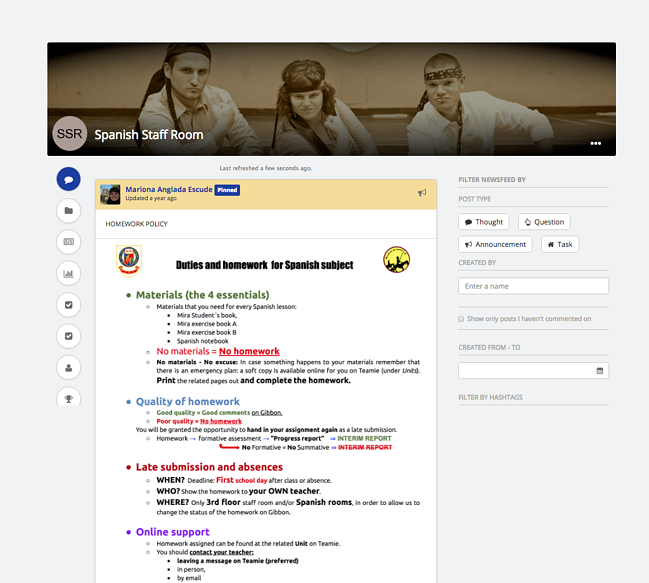 This is a separate work space on their Online Learning Platform (OLP) where they map the curriculum and build units, lessons, assignments, quizzes and rubrics to support their curriculum. 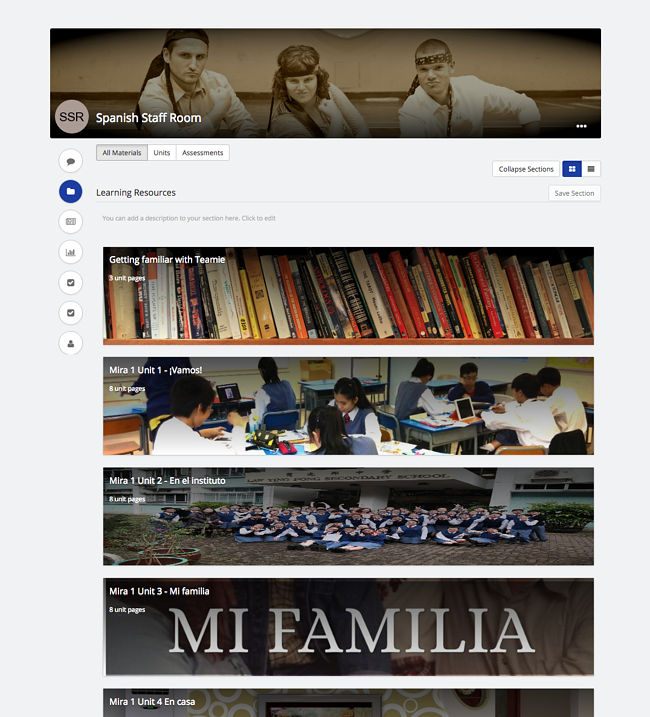 They also follow a textbook and the material created on Teamie supports that while introducing and adding a multimedia blended learning approach. A criteria of the WASC self assessment and accreditation is: “Challenging and Varied Instructional Strategies Indicator: The teachers strengthen student understanding and achievement of the learning outcomes through the use of a variety of instructional strategies that are selected on the basis of the learning purpose(s) and effectively engage students at a high level of learning. This includes the integration of multimedia and technology as appropriate.” Eduardo and his colleagues' usage of the OLP is a shining example and concrete evidence of this criteria. The organisation of their departmental workspace was very impressive, with policy documents and active newsfeed for ongoing collaboration, but what was most impressive was the sheer volume of material that had been created within their first year of platform usage. Eduardo indicated that while of course it was a time investment at first, the return on investment has been tenfold now that they are in their second year. The ease with which the resource creation can be parceled out to members of the department and then shared with individual classes, was identified early. They are now reaping the benefits with a well stocked resource library which can be added to, individualised and improved upon each year. When overall planning and prepping time is reduced, teaching staff can focus on the multitude of other tasks to improve teaching and learning and the benefactors are the students. Yet another advantage of building a robust resource library was realised by Eduardo and his team this year when a new staff joined their departmental team. Being a new teacher in a new school is always daunting and overwhelming with new policies, procedures and curriculum to learn and deploy. Having this well organised and well stocked departmental workspace proved to be a real time saver and stress minimizer for orientating the new staff member and getting them ready for and through the first days and weeks of teaching in a new school. Having easy access to policy documents in a central place saved all involved time and effort locating and deploying these to the new member. Any communication which needed to take place between the members of the department could be initiated or continued in the collaborative space on the Teamie platform saving them the headache of scheduling multiple meeting times to discuss policy and procedure or for orientation sessions. Finally, much of the preparation which a new teacher would have to undertake in those early days was done for them and they could enter the class relaxed and focussed on building quality relationships with their students. “A stitch in time saves nine”, meaning a timely effort will prevent more work later, Eduardo and his Team’s effort, have shown this proverb's essence and accuracy. As teachers toil to create new and inspiring ways to educate and inspire their students, processes which can be initiated and shared to better facilitate this process are invaluable, so our sincere thanks to Eduardo at Law Ting Pong for sharing.